The bottom ticker says that Nawaz Sharif's life is in danger, so he needs to be taken to London for a check-up. Above, there's a quote from Marriyum Aurangzeb along the lines of 'Lahore's hospitals from the last few years have involved politics so we don't have trust in them'. Nooras and their stupidity. Who has been in charge in Lahore? Are you freaking kidding me? How stupid can these Nooras get? It's actually kind of hysterical at the same time lol. ISLAMABAD: The Islamabad High Court (IHC) will once again take up the pleas filed by members of the Sharif family against their convictions in the Avenfield reference as well as former premier Nawaz's petition to transfer the Al-Azizia and Flagship references to another court. A two-member bench comprising Justice Aamer Farooq and Justice Miangul Hassan Aurangzeb will hear the appeals today (Thursday). During the last hearing, Nawaz’s counsel Khawaja Haris had pleaded to shift the trial of the remaining corruption references to another court. Haris had argued that Accountability Court-I Judge Muhammad Bashir has already disclosed his mind by punishing his client in the Avenfield reference. On the court’s query, Nawaz’s counsel had also stated that the investigation officers in all three references are different whereas the witnesses and their defence is common. After hearing Nawaz's petition to transfer the two remaining references to another court, the two-member bench will take up the Sharif family's pleas against their convictions in the Avenfield reference. RAWALPINDI: Former prime minister and supreme leader of the Pakistan Muslim League-N (PML-N) Nawaz Sharif has sent a message to his party leaders and workers from Adiala jail, asking them to continue protest against alleged rigging in the July 25 elections. According to PML-N leaders who met Mr Sharif, his daughter Maryam Nawaz and son-in-law retired Capt Muhammad Safdar in the jail on Thursday, the former PM has also asked them to make a joint strategy with other opposition parties. A number of PML-N leaders and family members met the incarcerated leaders of the PML-N in jail. Prison authorities arranged the meeting in a conference hall adjacent to the jail superintendent’s office. Talking to reporters outside the jail later, they said Mr Sharif was of the opinion that people’s mandate had been stolen in the elections. Senator Mushahid Hussain Syed said the morale of Mr Sharif and Ms Maryam was high. He said they both wanted the PML-N leaders and workers to continue protest against alleged rigging in the elections. A senior PML-N leader later told Dawn that the party leaders briefed Mr Sharif on their talks with other opposition parties in their recent meetings. They also got former PM’s approval for the opposition parties’ expected nominees for the election of prime minister, speaker and deputy speaker in the National Assembly. He said PML-N president Shahbaz Sharif informed the former PM about the party’s efforts for the formation of its government in Punjab. The request of a number of other PML-N leaders and workers to meet the former PM was rejected by the jail authorities after which charged workers confronted security personnel outside the jail. The jail authorities banned the entry of media DSNGs on the outer side of the jail which sparked unrest among media personnel. Some female workers of the PML-N staged a demonstration outside the jail and demanded release of Ms Maryam. The family members and relative who met the Sharifs in the jail included PML-N president Shahbaz Sharif, Mian Yousuf Abbas and Mian Aziz Abbas (nephews of Nawaz Sharif), Junaid Safdar (son of Maryam Nawaz), Sajjad Ahmed and Dr Waqar Awan (brothers of Mr Safdar) and Col Zafar (cousin of Mr Safdar). Among the PML-N leaders who visited the jail are: National Assembly Speaker Sardar Ayaz Sadiq, Punjab Assembly Speaker Rana Iqbal, Senators Pervaiz Rashid, Chauhdry Tanvir Khan, Begum Najma Hameed, Begum Tahira Aurangzeb, Raja Zafarul Haq, Javed Hashmi, former federal minister for health Saira Afzal Tarar, Marriyum Aurangzeb, Ahsan Iqbal, Tariq Fatemi and his wife, Irfan Siddiqui, Khawaja Asif, Dr Tassaduq Malik, Miftah Ismail, Siddiqul Farooq, Malik Abrar Ahmed, Sardar Mumtaz and Rana Mubashir. Caretaker federal Minister Barrister Ali Zafar also met Mr Sharif in the jail. A team of doctors from the Pakistan Institute of Medical Sciences also visited Adiala jail and examined Mr Sharif. They termed his condition better. During the medical examination, Mr Sharif’s personal physician Dr Adnan Khan was also present. PML-N leader Tallal Chaudhry, who was awarded sentence in a contempt of court case, also met the former PM in the jail. Answering questions of reporters about his sentence outside the jail later, Mr Chaudhry said that he was expecting such a judgement. Mayors of as many as 10 cities of Punjab visited Adiala jail to express solidarity with the detained leaders of the PML-N. They included Rawalpindi mayor Sardar Nadim Ahmed Khan, Aqeel Anjum Hashmi (Bahawalpur), Navidul Haq (Multan), Asad Ali (Sahiwal), Malik Aslam Navid (Sargodha), Shahid Chandia (D.G. Khan), Haji Nasir (Gujrat), retired Col Mubashir Javed (Lahore), Razaq Malik (Faisalabad) , Chaudhry Toheed Akhter (Sialkot) and Sheikh Ansar (Islamabad). Once again a convict allowed to send messages out to public. Makes one wonder if such facilities and luxuries are there for all convicts. Convicted criminal and the patronage seekers. This is disgusting beyond words. You can never underestimate the stupidity of a Noon Goon. This whole affair is just funny now. I remember the quote in Mushatraf's book which said something like Nawaz and Shabaz have had hair transplants but what they needed was brain transplants instead. Such is their stupidity and buffoonery. Nawaz for sure, however I alwaus thought Shehbaz was quite a shrewd operator, I take it I was mistaken? More intelligent than Nawaz and definitely more capable but still part of the baffoon club. LAHORE: The chief justice of the Lahore High Court (LHC) on Saturday constituted a full bench to hear a petition seeking annulment of the punishment handed to the Sharif family in the Avenfield properties corruption reference. On July 6, an accountability court had sentenced former prime minister Nawaz Sharif to a total of 11 years in prison and imposed a £8 million fine (Rs1.3 billion) on him in the Avenfield corruption reference. His daughter Maryam was sentenced to eight years in prison with a £2 million fine (Rs335 million), while her husband Capt (retd) Safdar was given a one-year sentence without any fine. ISLAMABAD: The Islamabad High Court (IHC) will resume hearing on Tuesday the plea of former prime minister Nawaz Sharif to transfer the remaining corruption references against him to another court. IHC had clubbed the two references, which will be heard by a two-member bench comprising Justice Aamer Farooq and Justice Miangul Hassan Aurangzeb. During Monday’s proceedings, National Accountability Bureau (NAB) prosecutor Sardar Muzaffar Abbasi argued that case transfer was not possible post-indictment. Judge Bashir had been hearing the defence's arguments in Al-Azizia and Flagship references for 10 months, the NAB prosecutor contended. Justice Aurangzeb observed that the evidence was interlinked in all three corruption references. "How can these interrelated facts be separated? This case is not ordinary in nature. It cannot be compared to the cases we hear on a daily basis," he noted. The NAB prosecutor then pointed out that the defence had not petitioned in the Supreme Court against rejection of the plea to club all three references. Once the accused is indicted then the reference cannot be transferred, he said. @mia sorry for not replying. I was busy traveling back to naya pakistan. And the cheater is alight according to those investigation and has been rightfully sent back to adyala. What’s the practical implications of this decision and where does it leave the SC decision? Judge Bashir after so much pressure from media, sharif family etc is no more hearing the case but the verdict in one ref by him will stay as it is although the rest of the 2 refs will be merged and heard together by another bench of 2 judges. From what i heard they are going to hear it from the point where Judge bashir left instead of starting from 0. But practically how would the new judges know what had gone on before? This makes little sense. I am also not sure about that but well every evidence, document etc is already in record? There was a misunderstanding actually the 2 member bench of IHC decided that the another judge of Accountability Court will hear the pending references not the bench. I believe like any other judge, Accountability Court's judge will read the transcript, examine the evidence, read judge's notes etc. ISLAMABAD: Accountability Court II on Thursday summoned deposed prime minister Nawaz Sharif on Monday in two pending corruption references against him and his family. The order came as Judge Arshad Malik heard the Al-Azizia and Flagship Investment references. Judge Malik also directed the prosecution to present Panamagate Joint Investigation Team (JIT) head and prosecution's star witness Wajid Zia for the hearing on August 13. As the hearing went under way, Judge Malik questioned National Accountability Bureau's (NAB) Deputy Prosecutor General Sardar Muzaffar Abbasi regarding the progress in investigations into the two remaining corruption references. The NAB prosecutor told the accountability court judge, "After Wajid Zia, only one more witness's statements need to be recorded." "There are three suspects in both the references. Investigation is ongoing against Nawaz while his sons, Hasan and Hussain, have already been declared absconders in the case," he further said. The hearing was then adjourned till Monday. A two-member bench of the IHC, comprising Justice Aamer Farooq and Justice Miangul Hassan Aurangzeb, ordered transfer of the cases on Nawaz's plea. IK should hold a one on one meeting with Nawaz and give him ultimatum that Nawaz and his daughter+son in law would be released from jail and sent on permanent exile from Pakistan if the entire Sharif clan hand over 95% of their looted wealth at home and abroad. They would also be restricted from participating in politics ever again. Pakistan benefits more from having the Sharif's looted wealth in the treasury than having Nawaz in jail. If this plan pans out I can easily estimate that atleast 10+ billion that Nawaz and Shahbaz may have stolen would immediately be added to our foreign reserves and this would definitely help Pakistan. At the moment we need money and lots of it. Keep them in jail forever and sieze and bring back the Looted money. In this day and age it’s much easier to trace money and of course assets (including properties). Do you think the foreign governments would be willing to just give back billions of dollars because the Pak government asked nicely? Immediate expulsion of billions from their economy would be a cause of concern for any country. There are laws set out for this, especially in the UK. If the money is stolen from Pakistan coffers, I.e belonging to the people, there is no way the UK can withhold it. Easiest option would be for the UK to sanction sale of properties at 20pct below market value. The UK gains in terms of tax revenues from the sale, the UK property market benefits and Pakistan benefits. There is a deal to be had which keeps the crooks in jail. There are also laws for not giving the citizenship to suspected criminals without due process. Yet not only Altaf got the passport but he continued to direct murders from London. UK government isn't going to hand anything to Pakistan without trying to pocket it themselves first. Trust me it’s so easy here. They just need someone with a strong will to get it done. I have worked in UK as a lawyer, Altaf should have been deported long ago if they follow the rules properly. You can't even get nationality if you do speeding, never mind the nonsense Altaf got upto back home! The UK govt now more than ever is open to any deals that will give it something..Brexit is about to turn this country into a basket case and any helping hand from somewhere will be looked upon favourably. They have their eyes on CPEC and some of the billions on offer if you lay your cards right. Imran has a good profile here and one visit can really turn things around in Pakistan Uk relations. Theresa May is an ex Oxford alumni who was introduced to her current husband by Benazir. i'm sure she knows Khan as well. He has contacts within the tory party..e.g. goldsmith and co..
he is an intelligence asset that has now outlived his usefulness. For nearly 30 years they used him to create such strife that our main city was crippled. It will take decades to recover. He has done his job. Capt (retd) Muhammad Safdar, son-in-law of deposed prime minister Nawaz Sjharif, was shifted to the Pakistan Institute of Medical Sciences (Pims) from Rawalpindi’s Adiala Jail over health concerns, Express News reported on Thursday. Safdar, Pakistan Muslim League-Nawaz (PML-N) leader, is serving a sentence in the Avenfield reference. However, owing to his deteriorating health he has been shifted to the federal capital’s public hospital. According to jail authorities, after going under the knife for the compression of his liver he is in pain. It is believed that the PML-N leader vomits anything that he eats or drinks, hence he has been shifted to hospital. On July 29, Nawaz, who was jailed over graft charges, was also shifted to Pims after developing serious cardiac complications. The disqualified prime minister and his daughter Maryam were arrested on July 13, minutes after they returned to the country seeking to revitalise their flagging party ahead of a July 25 national election. To be honest all the people like Nawaz are assets for the West as well. Everyone knew Zardari got his wealth from corruption, all his UK estates yet noone had a problem. All these "heroes" falling ill in prison, what ever happened to the bravado? and Laws have just recently been introduced to cover all this. Laws for money laundering were always in place, its just that now they are more specific. Zardari was called Mr 10% by Cameron himself, everyone knew his Surrey estate and the lot were thefts yet noone did anything about it. Even as we speak the UK knows we have absconders sitting in their country and the flats in London are by theft, yet they have done nothing. The JIT report said there was absolutely zero cooperation from British authorities via official channels. What tells you that these crooks can be trusted ?? Don't we know how they honoured the agreement they had signed with Musharaf , the noora kept refusing to hv signed any detail let alone honouring that deal. We have paid more than enough for Musharafs foolishness, we just can't afford a repeat of 90s..
Nawaz and his daughter are playing the wait game. They know they have setup pti for failure and within a year pakistanis will start cursing pti government like they did with ppp before noon and musharaf before ppp. After that guess who will emerge as heroic savior? Yes, yours truly. And the cycle repeats. Pakistan doesn't have an institutional party, they all revolve around one or two personalities (families) and pti is the same. Once IK goes and pti capitulates then what happens? I'm optimistic but that's just how I see this drama unfold. Nawaz is not that stupid to go to jail he knows this will give him brownie points as the qoum loves convicts more. They tried this trick in 2013 and it backfired badly they thought giving the province that is in worse condition will result in their favor and PTI future will end there but PTI came back with 2/3rd majority there and also in center and punjab based on performance there. I know federal government is a lot different but i am positive. The wait game only works on gov. committing massive blunders, he played it in 2000 and would still be living in king fahads palace in saudi if Musharraf didnt sack the CJP, Mush's blunder gave him a second life otherwise he would have been finished. Now his fate rests with PTI, if they deliver to punjab in the next 5 years, we can see the same sceneario what happened in KP, where pti went from 33 seats to 66, from one election to the other. Looking at the way IK has focused his campaign on Punjab targeting the Sharifs for the last 10 years even when PPP was in power, it wont be suprising if the fedral gov. spends all its focus and sources in punjab to end the Sharif Dynasty once and for all. @Bold. People might curse PTI government but they will not be going anywhere until the military turns its back towards PTI and I don't see that happening in a year. No way they are bringing back PML N after 1 year. Since past 5 years PMLN has made one poor decision after another. From letting PTI form the government in KPK to not going for reelection when Nawaz Sharif was ousted by the Supreme Court. Baby Maryam ko jail main garmi lag gae? ab vote ko izat kese milegi! ISLAMABAD: Former prime minister Nawaz Sharif appeared on Monday before an accountability court hearing two corruption references against him and his family. The former premier, who is currently incarcerated in Adiala jail, was brought to the court in an armoured vehicle. Accountability court Judge Arshad Malik will hear the Al-Azizia and Flagship Investment references shortly. Panamagate Joint Investigation Team (JIT) head and the prosecution's star witness Wajid Zia will also appear for the hearing. Judge Malik had summoned Nawaz and Zia during the last hearing on August 9. During the last hearing, Judge Malik had questioned National Accountability Bureau's (NAB) Deputy Prosecutor General Sardar Muzaffar Abbasi regarding the progress in investigations into the two remaining corruption references. The NAB prosecutor had told the accountability court judge, "After Wajid Zia, only one more witness's statements need to be recorded." A two-member bench of the IHC, comprising Justice Aamer Farooq and Justice Miangul Hassan Aurangzeb, ordered the transfer of the cases on Nawaz's plea. LAHORE . : The Lahore High Court (LHC) Chief Justice Muhammad Yawar Ali has constituted another full bench to decide a petition challenging the July 6 conviction of former premier Nawaz Sharif, his daughter Maryam and son-in-law Captain (retd) Safdar under the National Accountability Ordinance (NAO) 1999. The bench will be headed by Justice Shahid Waheed and comprise Justice Atir Mahmood and Justice Shahid Jamil Khan to hear a petition moved by the Lawyers Foundation for Justice through A K Dogar. This is a reconstituted bench as on August 8, the LHC judge Shams Mehmood Mirza recused himself from an earlier notified three-judge bench owing to ‘some personal reasons’ and sent the same petition back to the LHC chief justice to fix it before any other appropriate bench. Justice Sajid Mehmood Sethi and Justice Mujahid Mustaqeem Ahmed were the other members of the earlier bench. In the petition, Dogar questioned the NAB Ordinance 1999 and functioning of the courts under it. He said NAB court which convicted the Sharifs had no jurisdiction to decide the matter as the law under which it had been functioning had lapsed long ago. He requested the court to suspend operation of the accountability court’s decision as the court had been functioning under a non-extant law. He said former military dictator General Pervez Musharraf promulgated the NAB ordinance to arrest politicians. Musharraf took the charge in Oct 1999 while the NAB law came into being in Nov 1999, just one month later. He said the NAB Ordinance 1999 contends that the ordinance was promulgated by a military dictator under Provisional Constitutional Order (PCO) No 1 and order No 9 of 1999. He argued that under Article 270-AA of the Constitution through the 18th amendment, the PCO No1 of 1999 was declared without lawful authority and of no legal effect. Order No 9, he said, was promulgated only to amend the PCO No 1 of 1999 with the insertion of section 5A (1) in it to the effect that limitation of 120 days prescribed under Article 89 of the Constitution to any ordinance by the president will not be applicable to the laws made under PCO No 1 of 1999. The lawyer contended that as the PCO No 1 was declared without lawful authority and of no legal effect, the amendments in it made under order No 9 of 1999 would also lapse and therefore, the limitation period of 120 days prescribed under Article 89 would be applicable to the NAB ordinance. He said certain laws which were still enforced, shall continue to remain enforced unless amended by the competent legislation under sub-article 2 of Article 270-AA of the Constitution. Claiming that the NAB ordinance has ceased to be the law and become non-existent and a dead letter, he requested the court to set aside all those proceedings being carried out by the NAB courts under the ordinance. Safdar was shifted to the prison after his health improved, according to Express News. On August 9, he was taken to Pims after his health deteriorated following a liver surgery. Last week, a medical board of Pims doctors said Safdar had to remain in hospital due to health concerns. They performed an ECG to determine the condition of his cardiac stent and also conducted a liver test. Safdar is said to be suffering from diabetes and a liver ailment. Last edited by MenInG; 14th August 2018 at 23:18. Pakistan Muslim League-Nawaz (PML-N) leaders Nawaz Sharif, Maryam Nawaz and Captain (rtd) Safdar marked the country’s Independence Day by cutting cakes behind bars at Adiala Jail on Tuesday. The PML-N big wigs are serving their sentences in the Avenfield reference ditched out by an accountability court over their failure to justify the means by which they amassed their wealth. Sources told Express News that Sharifs cut three 10-pound cakes, which were then distributed among the inmates. The PML-N leaders also prayed for the prosperity of the nation. “Our forefathers made innumerable sacrifices for Pakistan and if needed we won’t back off on making the same sacrifices also,” the country’s former premier was quoted as saying. “I’ll always work for the progress of our country by always serving its citizens,” Nawaz said. “During the PML-N government’s reign Pakistan was transformed into a nuclear power,” he added. Earlier in the day, Safdar, the son-in-law of former prime minister Nawaz Sharif, was shifted back to Adiala from Islamabad’s Pakistan Institute of Medical Sciences (Pims) after his health improved. On August 9, he was taken to the federal capital’s public hospital after his health deteriorated following a liver surgery. Last edited by Abdullah719; 16th August 2018 at 23:51. ISLAMABAD: Former prime minister Nawaz Sharif was produced before the Accountability Court in connection with Al-Azizia Steel Mills and Flagship Investment references. After the hearing, reporters asked him to describe his ordeal in Adiala Jail. "How are you doing," asked a reporter. " Alhamdolillah, I am good," replied Nawaz Sharif. "Are you allowed to perform Namaz at mosque," asked the journalist. "No, I am not permitted to go out, I perform Namaz at my cell," responded the former prime minister. Asked whether he gets to meet his daughter Maryam Nawaz on daily basis, the PMLN supreme leader said he meets Maryam after a gap of a week when outside visitors visit him. "Are you in a solitary confinement," the media person asked. "Yes, you can say that," answered Mian Muhammad Nawaz Sharif. Adiala Escape is an endless running video game developed by Gamepak Studios featuring two of the most crucial characters in Pakistan’s elections. Yep, Imran Khan chasing Nawaz Sharif while he tries to escape from Adiala Jail and collects money along the way. So being locked up in jail cell is now akin to solitary confinement according to this gormless duffer. A desperate National Accountability Bureau (NAB) on Saturday literally begged the Islamabad High Court (IHC) that the petitions filed by deposed prime minister Nawaz Sharif, his daughter Maryam Nawaz and her husband Captain (retd) Safdar the suspension of Avenfield properties reference verdict are not maintainable and should, therefore, be dismissed with costs. “NAB begs with all humility that the instant writ petition is not maintainable before this Hon’able Division Bench,” Deputy Prosecutor General Sardar Muzaffar Abbasi stated in one of the para-wise comments filed against Sharifs’ petitions before the IHC. Interestingly, the NAB prosecutor said Sharifs’ were convicted in the Avenfield Apartments’ reference by the accountability court on July 6 on the basis of “conclusive presumption”. “The irrebutable and conclusive presumption for the purpose of establishing conviction has been essentially adhered [to] by the Learned Accountability Court,” he stated. Subsequently, he stated, the judgment in lieu of the circumstances of the case does not merit to be suspended. While raising objection on the formation of the division bench, Abbasi said the division bench formed to hear the writ petition is the sole prerogative of the high court’s chief justice but the petitioner is required to make such a request to the chief justice. The NAB prosecutor maintained that documentary evidence adduced along with the ocular examination duly recorded by the trial court emphatically establishes the prosecution case, adding each and every objection on the receivability, relevancy, production and admissibility of documentary evidence have been cogently dilated by the trial court. Sharifs counsel — Khawaja Haris and Amjad Pervaiz – have repeatedly maintained before the court that several objections raised before the trial court have not been decided in the judgment. On the other hand, Abbasi argued that the prosecution discharged its burden and standard of proof as envisaged in the provisions of the NAB Ordinance of 1999 and proved the charges framed against the accused. “There are no legal infirmities apparent on the face of the judgment” announced on July 6, he said, adding “deep appreciation of evidence” can only be considered in the appellate jurisdiction of high court and not during constitutional proceedings. He added that appeals against the judgment is already fixed immediately after the conclusion of the summer vacations and, therefore, the suspension petitions may be held in pendency till the hearing of the main appeals. Irked by the NAB’s failure to present arguments on August 16, the IHC’s division bench, comprising Justice Athar Minallah and Justice Miangul Hassan Aurangzeb, imposed a fine of Rs10,000 on NAB for seeking adjournment instead of arguing after the petitioners had already concluded the arguments. The bench had expressed extreme displeasure at NAB before slapping the fine and directed prosecutors to conclude arguments in the case on August 20 (Monday). The court had directed NAB to file para-wise comments by Saturday. Earlier, the high court had turned down NAB’s application seeking adjournment on August 15. In the pray, he said, the petitions are neither maintainable nor competent and they be dismissed with costs. The IHC’s bench will take up the petitions on Monday and following NAB’s arguments, the court is expected to reserve verdict on Sharifs’ petitions. LAHORE: Punjab Home Department has given approval for providing Maryam Nawaz, the daughter of convicted prime minister Nawaz Sharif, air-conditioner facility at the Adiala Jail, according to sources. 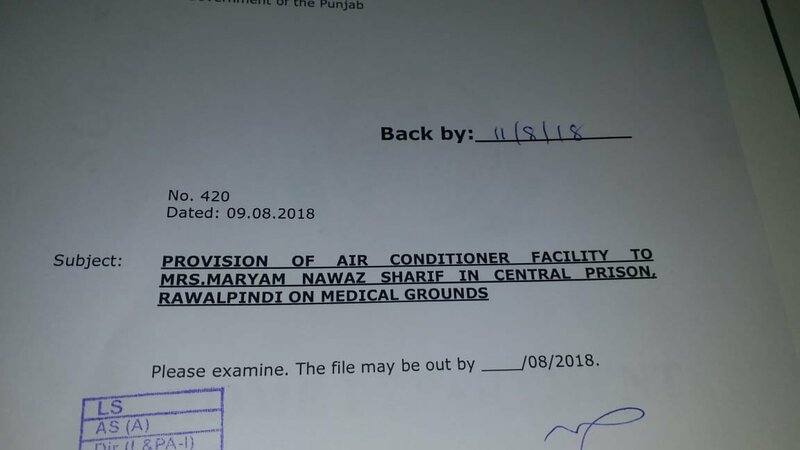 Due to severe heat and muggy weather conditions, doctors have suggested the jail authorities to provide the air-conditioner facility to Maryam Nawaz. The jail authorities sent a summary to the provincial home department, which forwarded it to the caretaker Punjab cabinet. The cabinet approved the summary and sent it to the caretaker chief minister, who gave the final approval. Why only to her? What makes her special? ISLAMABAD: Former prime minister Nawaz Sharif will appear before the accountability court on Monday as it will resume hearing two remaining corruption references against him and his family. Accountability court II Judge Arshad Malik will resume hearing the Al-Azizia and Flagship Investment references. Directing Alam to continue recording his statements during the next hearing, the court had adjourned the case till today. The court alhas summoned prosecution’s star witness and Panamagate Joint Investigation Team (JIT) head Wajid Zia for the hearing. During the hearing, Nawaz's counsel Khawaja Harris appealed to Judge Arshad Malik to announce a joint verdict in the two remaining referenced filed by the National Accountability Bureau (NAB) against the Sharif family. "Accountability court I had also decided on a joint verdict in the three references. However, it only announced its verdict in the Avenfield reference," Harris said. "The other two cases were then transferred as verdict on one of them came separately," Nawaz's counsel upheld. Approving Harris's request and ordering a joint verdict in the remaining two references, the court adjourned the hearing till August 27 (Monday). While talking to reporters, Sharif said that he used to pay the day-to-day expenses of the Prime Minister House from his own pocket. He added that he has the cheques as proof. ISLAMABAD: The newly inducted federal cabinet on Monday decided to place former prime minister Nawaz Sharif and his daughter Maryam on the Exit Control List. The first meeting of the new federal cabinet was held in Islamabad on Monday, following the swearing-in ceremony of its members. Prime Minister Imran Khan chaired the cabinet meeting, which discussed economic challenges and austerity measures, among other matters. A total of 16 ministers were inducted into the federal cabinet earlier today. Five advisers to the prime minister, along with a special assistant on accountability, were also appointed. The ministers inducted into PM Imran's cabinet include Mohammad Farogh Naseem (Minister of Law and Justice); Pervez Khattak (Minister of Defence); Shah Mehmood Qureshi (Minister of Foreign Affairs); Asad Umar (Minister of Finance, Revenue and Economic Affairs); Shiekh Rashid Ahmed (Minister for Railways); Zubaida Jalal (Minister of Defence Production); Fawad Chaudhry (Minister of Information, Broadcasting and National Heritage); Fahmida Mirza (Minister of Inter Provincial Coordination); Khalid Maqbool Siddiqui (Minister of Information Technology and Telecommunication); Shireen Mazari (Minister of Human Rights); Shafqat Mahmood (Minister of Federal Education and Heritage); Aamir Mehmood Kiyani (Minister of National Health Services, Regulations and Coordination); Chaudhry Tariq Bashir Cheema (Minister of State and Frontier Region); Noor-ul-Haq Qadri (Minister of Religious Affairs and Interfaith Harmony); Ghulam Sarwar Khan (Minister of Petroleum Division); and Makhdoom Khusro Bakhtiar (Minister for Water Resources). The advisers include Mohammad Shehzad Arbab (establishment portfolio); Abdul Razak Dawood (commerce, textile, industry and production and investment); Dr Ishrat Hussain (institutional reforms and austerity); Amin Aslam (climate change); and Zaheer-ud-din Babar Awan (parliamentary affairs). Former deputy prosecutor National Accountability Bureau, Mirza Shahzad Akbar, has been appointed as special assistant to PM Imran Khan on accountability. ISLAMABAD: The Islamabad High Court reserved on Monday its verdict on the appeals filed by the former prime minister Nawaz Sharif, his daughter Maryam Nawaz and son-in-law Capt (retd) Safdar challenging the Avenfield verdict against them. On July 6, an accountability court had sentenced Nawaz to a total of 11 years in prison and slapped a £8 million fine (Rs1.3 billion) in the corruption reference while his daughter Maryam was sentenced to eight years with a £2 million fine (Rs335 million). Additionally, Nawaz's son-in-law Capt (retd) Safdar was given a one-year sentence without any fine. The bench comprising Justice Athar Minuallah and Justice Mian Gul Mian Hassan Aurangzeb heard the appeals of the Sharif family. The NAB prosecutor Sardar Muzaffar Abbasi remarked that the Avenfield reference, pertaining to Sharif family's properties in London, were filed upon the orders of the Supreme Court adding that the investigation team was also formed following the instructions of the apex court. "The London flats were in the name of Nelson and Nescoll, which we proved were owned by Nawaz Sharif," he said. On July 16, the legal counsels of the Sharif family—who are currently serving their respective sentences at Adiala jail—had filed three different appeals on behalf of their clients. The appeals — that highlights the legal flaws in the Avenfield judgement — ask for the accountability court's verdict to be declared null and void and the three convicts to be released on bail. It states that the Panamagate Joint Investigation Team (JIT) head and prosecution's star witness Wajid Zia himself accepted that a response to the mutual legal assistance (MLA) request was not received. What happens if a corrupt Noora judge overturns the decision. One of the 2 judges owes the Sharifs. I think NAB can still appeal the verdict, if it turns out to be in favour of the convicts. Because we know a lot of low lifes owe the Sharifs for their positions and so far its only come out with 2 judges, one in the IHC and once in the SC. Lets see these crooks come out of the woodwork. This judgement sound and clear. Nawaz and Maryam names have been placed on ECL now, even if they get the bail they won't be able to go to London.